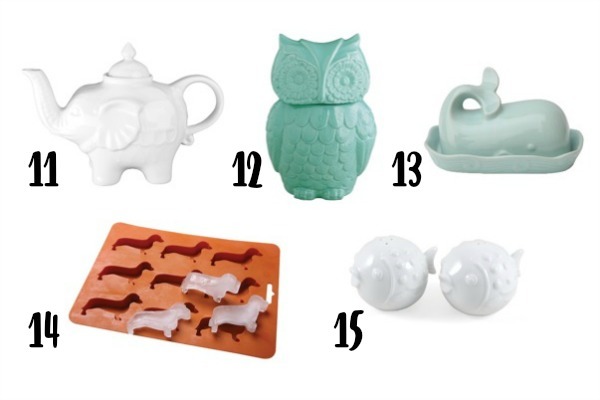 Today I’m sharing 20 fun finds for your kitchen – all under $20! It’s important to show your personality in your home and the kitchen is a great space to do so. I’m a big fan of cute tea towels (I bought a new one as a souvenir from Montana) plus I love my colorful knife set. Chopping onions is slightly more fun when you’re using a purple knife! I also have a cute owl utensil holder and an “ain’t nobody got thyme for that” cross-stitch from my friend Michelle (plus a few other fun items) that make me smile while I’m cooking. If your kitchen is currently lacking some personality, I’ve pulled together 20 items that will instantly add a pop of whimsy to your space. 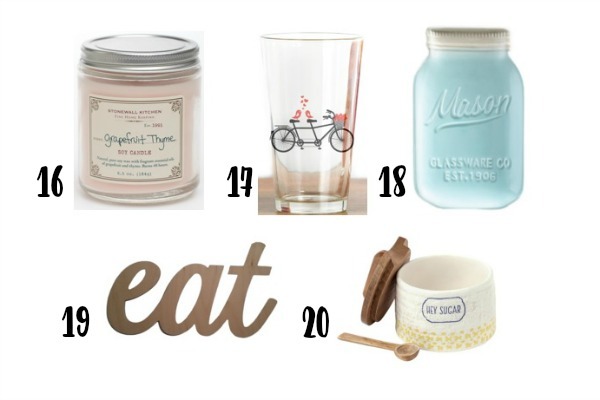 These items would also be great hostess gifts for an upcoming dinner party! I only own one of the items on the list below, but I want all of them! All of the items are available on Amazon…2 day shipping FTW! 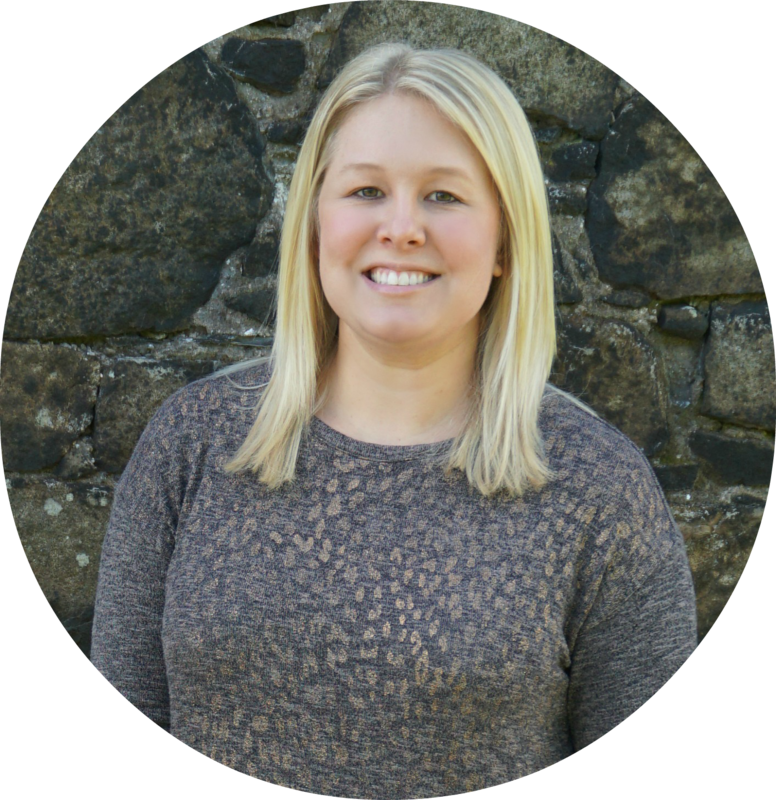 The links are affiliate links which means I get a small percentage commission at no additional cost to you. If you’re uncomfortable with that, just use the Amazon search to find the items – no worries! 1 – Every day utensils don’t have to be boring! This Jaime Oliver knife set is so bright and fun. Like I said before, chopping onions is slightly more fun when you are using a colorful knife! 2 - Show your state pride with this bamboo cutting board (looks like all of the states are available)! If you don’t want to use this for cooking, you could just lean it against the backsplash or hang it on the wall to bring some warmth to the kitchen (especially if you don’t have wood cabinets). 3 – Like I said above, utensils don’t have to be boring. There’s also a matching spoon that says “Stir Crazy”…too cute! 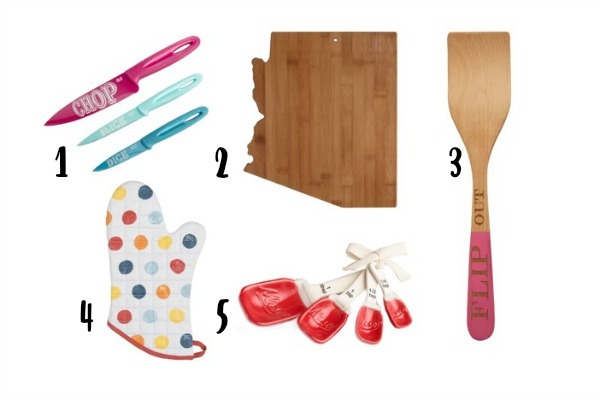 4 – Pot holders and oven mitts are a must in the kitchen, so they might as well have some personality. My favorite oven mitt is shaped like an alligator and I bought it while we were in New Orleans. I also have a set that I bought in Paris. 5 – These Mason jar measuring spoons are so cute! They’re also available in light blue and yellow. I know I’ve seen the light blue ones at World Market, but I don’t remember seeing the other colors. You might want to check prices in stores before ordering online. They’re probably cheaper, especially if you have a coupon! 6 – I mentioned before that I’m a big fan of tea towels and this one would be perfect for my BBFF Meaghan. She has long, beautiful red hair that always reminds me of Ariel. I’m definitely sending her this for her birthday. 7 – I don’t drink coffee and I rarely drink any other hot beverage, but this coffee cup made me laugh out loud. 8 – Speaking of laughing out loud, this tea towel is hilarious. As I write this, it’s only $6! I’ve already ordered one for my kitchen. I know my boyfriend is going to laugh too. 9 – As a Parks & Rec fan, I wish this said “Treat Yo Self” but it’s still cute, so I’ll let it slide. 10 – This brand has so many cute/funny utensils, but I love this serving set. They are kind of hard to read in the picture, but they say: Oh My Gravy, Get Saucy, and Just a Dollop. 11 – Elephants are one of my favorite animals, so I have a soft spot for this tea pot. 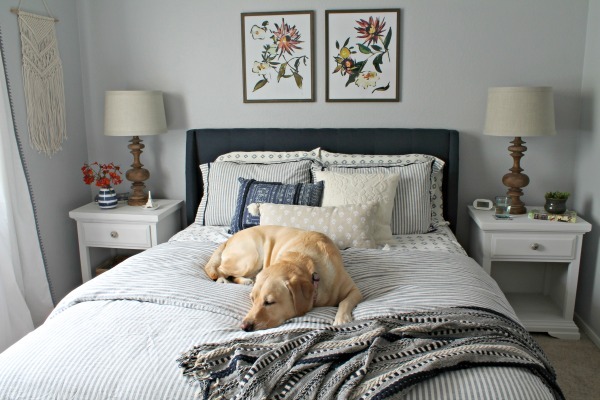 Plus the neutral color will look great in any space. 12 – I have a confession to make…I’m scared of birds. The real ones freak me out, but I love bird items in decorating. This owl cookie jar reminds me of my owl utensil holder. 13 – I need a butter dish and I love this cute whale one. 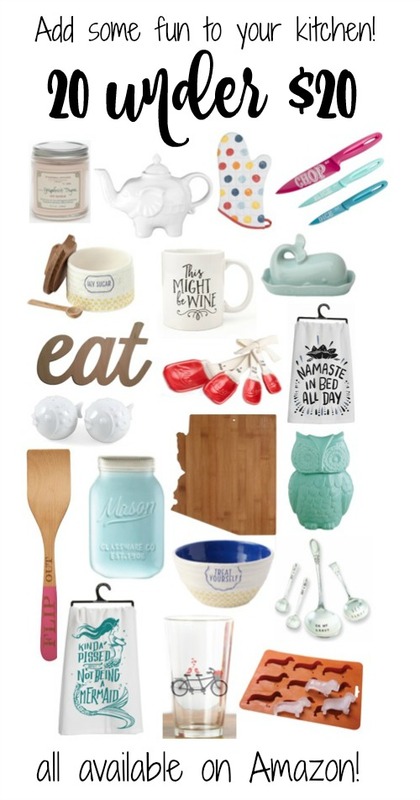 It would look so cute on the kitchen counter…or do you store your butter in the fridge? I keep mine in the fridge, but I know some people leave it out. I would guess it depends on the temperature of the room? 14 – Dachshund ice cubes! These would be so fun to make for a party, especially with kids. One of my friends has a wiener dog and her kids would go nuts for these ice cubes. 15 – Salt and pepper shakers are one of the easiest ways to add some personality to your kitchen. I like this set of blowfish shakers, but there are sets for everything and anything you may be interested in. Personally, I have an owl set and a tea pot set that was my grandma’s. 16 – This list is mostly focused on the look of your kitchen, but how about the smell? A scented candle is an easy way to liven up any room. Grapefruit thyme sounds like the perfect kitchen scent, but anything would work. 17 – How cute are these glasses? It would be too pricey to buy a full set of these, but I love the idea of fun drinking glasses. 18 – My mom bought me this spoon rest for Christmas a couple years ago and I still love it. It’s a fun pop of color on my black stovetop and it’s super handy. She bought it at World Market, so check there first if you have one nearby. I’m not sure if they are still available in store or not, but if so, it’ll definitely be cheaper that way. 19 – This eat sign could be left as-is or painted whatever color your heard desires. You could also add patterned paper or a fun design to the letters. 20 – This sugar jar is the same brand as #9. The whole kitchen line is adorable. Unfortunately, all of the reviews are sponsored and a few are even negative ones, so it’s hard to judge the quality. Has anyone seen these pieces in person? I’d be interested to know if they are as cute as the pictures. OK, so what’s your favorite item? 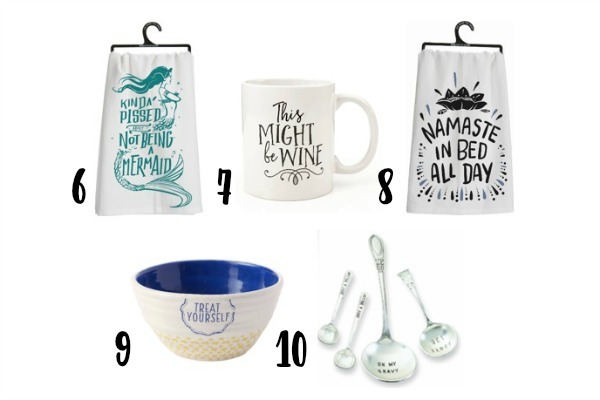 I love the Namaste tea towel (which I’ve already ordered) and the fun serving spoons (which I probably won’t order because I already have LOTS of serving utensils). It's all so cute! I love adding fun pops of color in the kitchen with things like these. I love fun tea towels too!